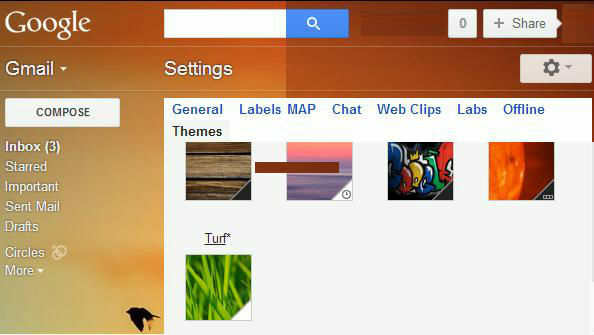 Make your Gmail even more lively and colourful with your favourite pictures. Gmail is very user friendly compare to other web base email in the way of giving it personal touch and making livelier with your favourite pictures. Gmail offers verity of pictures for background theme, plus you can upload your own favourite picture right from your computer and mobile phone. With just few click you can organise your gmail with either your favourite colour or your much-loved picture as a background of your email. If you want your favourite picture as background that you should your screen size and good quality of picture so you can get the best quality of view. Therefore Login to your gmail and select “Setting” (Located your top right hand side) and select “Themes”, then you will find all different kinds of preference. Here either you can choose from this list or if you want to upload your images then click on “change your background image” and select option “Upload photos” then click “select photo from your computer “ and finally select your photo. Now you can see everything changed according to your favourite photo.